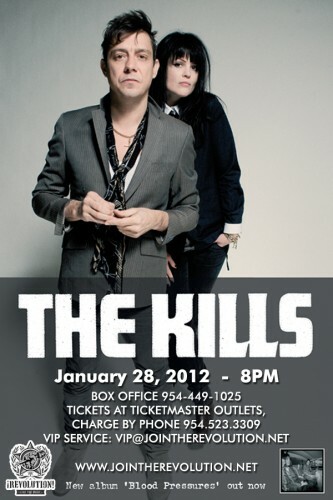 London rock duo, The Kills will be making their way to South Florida this weekend. The Kills are an indie rock band formed by American vocalist Alison “VV” Mosshart and British guitarist Jamie “Hotel” Hince. Mosshart had been in the Florida punk band Discount and Hince in British rock band Scarfo. When these groups disbanded in 2002, the duo, who first met when Mosshart heard Hince practicing in the hotel room above hers, struck up an enduring artistic partnership. Mosshart, is also part of the group The Dead Weather with Jack White. They are touring with JEFF The Brotherhood, known for their relentless touring and their “we’ll play anywhere” mentality. They have built a reputation for stripping rock music down to it’s basics, and delivering mind-bending live shows with Jamin’s three drums and three cymbals and Jake’s three-string guitar and ferocious vocals. JEFF The Brotherhood’s work ethic practically defines D.I.Y., from their simple but compelling videos to their self-produced and critically acclaimed albums, EP’s and singles.